Within hours of 50 Muslim worshipers being killed at two mosques, Australian far-right politician Fraser Anning had released a statement on what he called the "real cause" of the attacks. This, Anning claimed, was "the immigration program that allowed Muslim fanatics to migrate to New Zealand in the first place." Two days later, Anning appeared on the popular Sydney breakfast radio show "Kyle and Jackie O," telling KIIS FM listeners he condemned the gunman but insisting that "countries that have Muslim immigration" also have "an escalation in violence." With the accused gunman, 28-year-old Australian Brenton Tarrant, charged with 50 counts of murder and set to appear in court again in June, his homeland is facing some uncomfortable questions about how much airtime it gives xenophobic views. Experts say an increase in far-right figures like Anning in the mainstream media has led to a normalization of racism -- and encouraged far-right groups out from the shadows. In recent years, the "mainstream media has started presenting far-right figures and ideas as part of conventional public debate," Tim Soutphommasane, Australia's former Race Discrimination Commissioner, told CNN. "The default seems to be that racist ideas deserve an airing. Yet when this happens, it's not given the scrutiny or questioning that is warranted," he told CNN. During the Anning interview on KIIS FM, presenters did question the senator's logic, with Kyle Sandilands putting to the politician that terrorist attacks were not due to "a whole culture, it's just extreme mental cases." KIIS FM declined to comment on its decision to have Anning on the entertainment radio show. Despite the Australian Senate -- the upper house of Parliament -- formally censuring Anning for what lawmakers variously described as his "appalling," and "shameful" Christchurch comments, he doesn't appear to be apologizing anytime soon, telling Reuters the censure was "a blatant attack on free speech." CNN contacted Anning's office but had not received a reply at time of publishing. Australia's white supremacists "would certainly feel emboldened by Anning's remarks," said Stephen Morgan, a film lecturer at King's College London's Menzies Australia Institute, whose work has focused on historical representations of Australian identity in the media. Now in the wake of the Christchurch attacks, some Australian journalists are questioning the role their profession played in fostering racial division. Immigration has been a hot-button issue in Australian politics for decades, with the anti-asylum seeker rhetoric that emerged under former Prime Minister John Howard in the 1990s and 2000s -- his famous quote: "We will decide who comes to this country and the circumstances in which they come" -- becoming a key election issue in almost every federal election since then, Morgan told CNN. Today, that rhetoric has surged amid government figures and right-wing media commentators "singing from the same hymn sheet," he said. Morgan pointed to the debate around the Medivac bill passed in February allowing asylum-seekers on Nauru and Manus Island into Australia for medical treatment -- and which some senior politicians warned could see murderers and rapists enter the country. This kind of "everyday racism" had "emboldened far-right groups in Australia, especially over the past three to four years," Priscilla Brice, managing director of All Together Now, a racial equality charity in Sydney, told CNN. As the full horror of Christchurch unfolded, some Australian journalists were doing their own soul-searching. When Sky News Australia, a CNN affiliate, aired segments of the gunman's live stream, young Muslim journalist Rashna Farrukh decided she could no longer work at the conservative network, publishing a personal account of her years of moral anguish there. "As a young Muslim woman, I had many crises of conscience working here," wrote 23-year-old Farrukh, who worked for three years in the junior role of liaison at the network's Canberra studio. "I stood on the other side of the studio doors while they slammed every minority group in the country -- mine included -- increasing polarization and paranoia among their viewers," she wrote, urging other journalists to "act on our morals." In a statement, Sky News Australia said: "We respect Rashna's decision and wish her well with her future endeavors. As a news and national affairs broadcaster Sky News is committed to debate and discussion which is vital to a healthy democracy. We feature a broader range of views and counterviews that are challenged and held to account than anywhere else on Australian television." Turn on breakfast TV or current affairs shows in Australia today, and you'll often find figures who previously occupied the political fringes. One of the best known is One Nation's founder Pauline Hanson, who gained notoriety in the 1990s as a disgruntled fish and chip shop owner claiming the country was in danger of being "swamped by Asians." 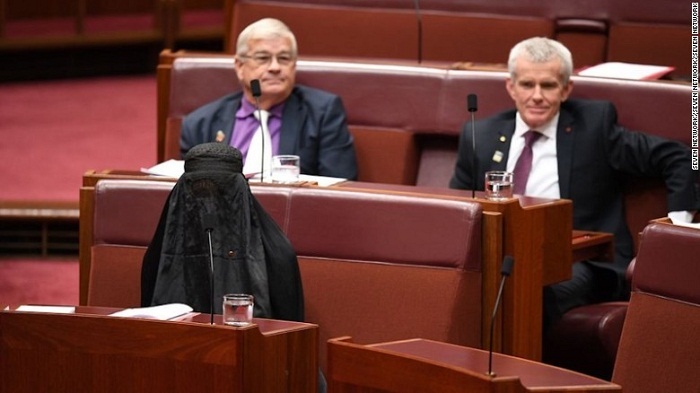 Hanson, who in 2017 wore a burqa in parliament in an effort to see it banned, and last year unsuccessfully moved a motion acknowledging "it's OK to be white," has more recently enjoyed a weekly guest spot on Channel 7's Sunrise show. She quit the show in March following a spat with its host, David Koch, over her political views and was later replaced by fellow One Nation politician Mark Latham -- someone who has previously campaigned for a DNA test for Aboriginals to ensure fair-skinned people were not cheating the welfare system. CNN contacted Hanson's office, which said she was "currently recovering from an emergency appendectomy" and was "not available to provide a response." Sunrise executive director Michael Pell stood by the decision to have Hanson and Latham on, telling CNN that the show "has always featured figures from not one, but all sides of the political spectrum." Pell included an extensive list of "regular political guests in recent years" that included former prime minister and Labor leader Kevin Rudd, Greens senator Sarah Hanson-Young and former Democrats senator Natasha Stott Despoja. "All have been given a regular platform and all have been held to account, no matter their politics," said Pell. But it seems some public figures are still deemed too extreme for TV. In August last year Sky News Australia faced a huge backlash for a 10-minute interview with neo-Nazi nationalist Blair Cottrell, in which he was asked about immigration and his political ambitions. The network said it was "wrong" to have Cottrell on air and pulled its Sunday flagship show -- "The Adam Giles Show" -- on which he appeared. According to Karen Farquharson, professor of sociology at Melbourne University, the Australian media's practice of giving equal weight to both sides of an issue had "contributed to an environment where racist voices have gotten unjustified air time." "At the heart" of racism in the Australian media, according to Morgan, are "structural problems around white supremacy in Australian society in general." "One only needs to look at the regularity with which white commentators -- on breakfast television and elsewhere -- take it upon themselves to comment on, and pass judgment upon, Indigenous issues despite a clear lack of expertise, experience, or knowledge," he said. Morgan pointed to veteran TV presenter Kerri-Anne Kennerley in January asking whether "Invasion Day" protesters had ever been to what she called the "outback," where "children, where babies and five-year-olds are being raped." Amid accusations of racism from a fellow Channel 10 panelist, Kennerley stood firm, later telling 2GB radio she "never made a racist comment," was "offended" by the suggestion that she had, and had "just stated a fact." As for Anning, an online petition calling for his resignation has now gained more than 1.4 million signatures. Often described as an "accidental" senator after gaining the job when a previous party member stepped down, Anning has quickly made a name for himself in Australian politics over the past year. The challenge now facing the Australian media, is just how much of the nation's airtime extremist voices deserve.